Having completed a unique, combined MRI fellowship covering musculoskeletal, neurological and body MRI, Dr Pellegrini plays an important role in helping to meet the ever increasing demand for expertise required for interpretation of this diagnostic modality. His exceptional training has allowed Dr Pellegrini to become an important contributor to a wide variety of complex diagnostic imaging procedures in addition to MRI. 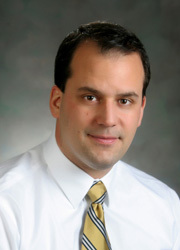 Dr. Pellegrini earned his medical degree at the University of Chicago. He completed his internship at Weiss Memorial Hospital in Chicago and Residency in Diagnostic Radiology at the University of Pennsylvania in Philadelphia. This was followed by a combined MRI fellowship at Thomas Jefferson University, in Philadelphia. He is board certified by the American Board of Radiology, and is a member of the Radiological Society of North America, the American College of Radiology, the Wisconsin Radiological Society and the American Roentgen Ray Society.